Crazy for First Grade: Saint Patrick's Day Addition and Subtraction Sort!!! 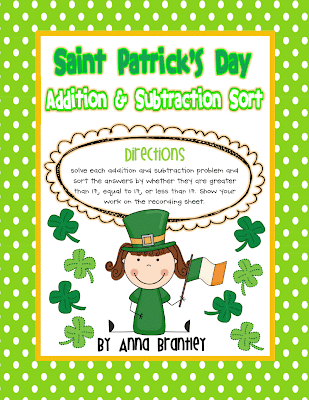 Saint Patrick's Day Addition and Subtraction Sort!!! I hope you enjoy this freebie!!! Click on the picture to download!! Come check out my blog. It is only a few months old. Happy Very Hungry Caterpillar Day Giveaway!! Q & A, plus a little green fun! !